Do you have a baby on the way or do you know someone that has a baby on the way? Either way, this precious milestone blanket is a perfect gift to capture those precious moments and memories of your little angel! Amimal Print Design: Is hunting going to be in this child's future? The animal print design symbolizes that your sweet baby will grow-up with courage, wisdom, grace, and strength Premium Quality Ultra Soft: Made with premium fleece fabric that is very soft and gentle to the touch, which is ideal for your baby's sensitive skin. Simple Care: Easy to clean and quick to dry. Multifunction: Our personalized monthly milestone blanket is not only used as an amazing photo prop. Wrap this small cute blanky around your sweet baby or spread it out on the bed. 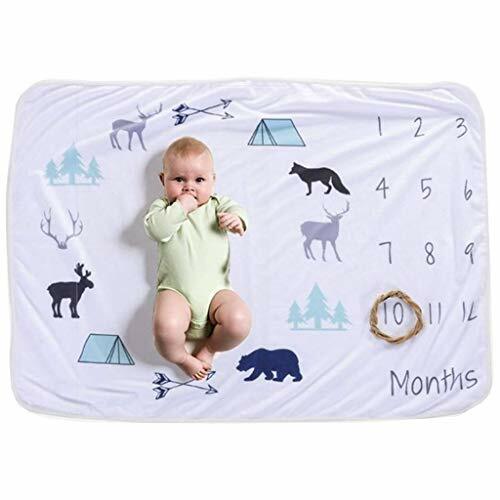 Our monthly milestone blanky set includes one baby milestone blanket and one month marker which is used to circle the number of your baby's age in months. Ideal gift for newborns and new moms. It is perfect way to capture the greatest memories of your baby's first year. WHY CHOOSE IT? It's a wonderful photo background for: Scrapbooks, Social Media Posts, Baby Book, Calendar, Birthday Invitations Other uses include: Nursing Cove, Stroller Blanky, Baby Blanket, Swaddling. Please Note Product size: 30''X 40'' If you like it, buy it now before we're all out! If you love this product, feel free to share it on social media or write a review. Thank you! UNLEASH YOUR CREATIVE SIDE - With a size of 30" x 40" our hunting animal print milestone blanket has enough room to accommodate your baby and all the props you're using to highlight their age. Whether you're using wood photo frames, flower frames, holiday ornaments, etc. you will have everything to create a keepsake photo diary, scrapbook, baby album, or milestone board featuring baby's development up to 1 year. If you have any questions about this product by Boutique Lover, contact us by completing and submitting the form below. If you are looking for a specif part number, please include it with your message. Lopsy Lamb Comfy Cozy Blanket by Gund Baby 24"